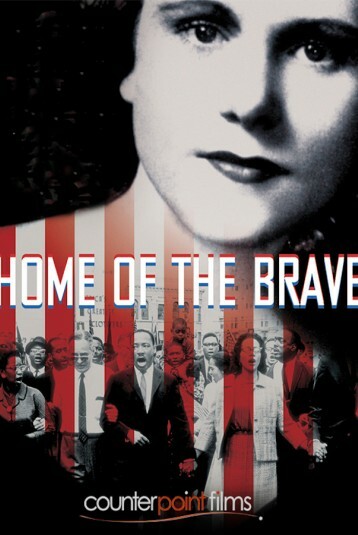 Home of the Brave is about the only white woman murdered in the civil rights movement in America and why we DON'T know who she is. Told through the eyes of her children, the film follows the on-going struggle of an American family to survive the consequences of their mother's heroism and the mystery behind her killing. Viola Liuzzo was a 39 year-old Detroit Teamster's wife and mother of five, who joined thousands of people converging in Selma, Alabama for the march on Montgomery, led by Martin Luther King in '65. But shortly after the historic Voting Rights March had ended, she was shot in the head and killed by a car full of Klansmen, while driving on a lone highway. Liuzzo's death came at a pivotal moment in the civil right movement, when President Johnson had been fighting an uphill battle to push the Voter's Rights Act through Congress. Her murder is attributed by historians of the era as providing the final piece of leverage that won Johnson approval of the Act in Congress, which forever changed our political landscape. Why do we not know the story of Viola Luizzo, while nearly everyone has heard of Goodman, Schwerner and Cheney -- the three rights workers killed the year before in Mississippi? The reasons are complex, and won't be found in history books. Immediately following her murder, Liuzzo became the target of a smear campaign, mounted by J Edgar Hoover and the FBI, as a means of diverting attention from the fact that a key FBI informant was in the car with Liuzzo's killers. This discrediting of her name -- mostly based on her gender and wholly unfounded -- succeeded in erasing Viola Liuzzo from our cultural memory. After delving through thousands of pages of government documents and filming interviews with leaders in the fields of politics, history and forensics psychology, the filmmakers shed a new light on this complicated, buried story. Parallel to the Civil Rights struggle for which Viola lost her life is the present-day journey of her five children. Mary, the middle daughter, decides to retrace her mother's road trip from Detroit to Selma with the filmmakers. In the mid-60s she was an angry kid in the midst of a personal rebellion with her mother. The trauma of her sudden death caused her to bury any memories of her mother. Instead, she found herself reliving only the details of her gruesome death and its tumultuous aftermath. Now as an adult, she's ready to bring her back into consciousness. What she finds in Selma is both surprising and profoundly healing. Her brothers Tony and Tommy, who as boys felt the weight of it all on their shoulders, were eventually hit the hardest. Theirs is a path routed in turmoil, resulting largely from repeated failed attempts to vindicate their mother and seek justice their family. Their lives have been torn apart by what they see as a betrayal of their government, and after decades of fighting, they've each resigned themselves to their own form of refuge, which disconnects them from their sisters and the rest of the world. Home of the Brave links the personal and the political, the past and present and has a resonance to our world today. In its run on the festival circuit this year, Home of the Brave has garnered a Best Documentary Award (Port Townsend), Social Justice Award (Santa Barbara), an Audience Choice Award (Cleveland) and a prize for Outstanding Film with a Social Message (Maine). The International Documentary Association has selected the film to participate in its In Fact Theatrical Showcase which qualified the film for the 2005 Academy Awards and has also nominated it for the its own annual awards in the category of Best Documentary.